Once in a while I find a new product that I think is sheer genius and the Tuc-Away Table is one of those products. We are a family of five and live in an average sized home with twice a year extended visits from my father-in-law. Many times we have had a need for a side table without the space for it and my father-in-law always requests to have a bedside table in his room. This has always been a dilemma i.e. where to store the table(s) when not in use. 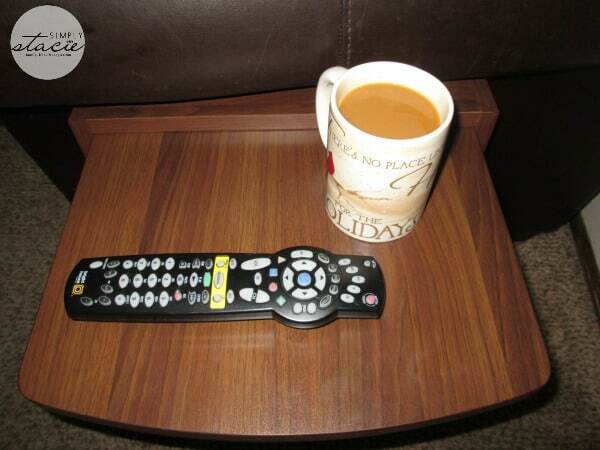 The Tuc-Away Table (SRP $69.96) solves this problem because it the ultimate space saver. How does it work? The Tuc-Away Table is designed to attach to virtually anything such as the sofa, chairs, beds and recliners. It has a patented spring bar which slides directly under the piece of furniture so the table can be positioned anywhere you want. When not in use, it simply folds down and blends into the room opening back up that space. A huge bonus is that there is no assembly required and my husband likes that he can easily disassemble with having to use any tools it so it can be stored in the closet or attic as needed. Available in black or brown finish this modern table would be great for many home decors as it is sleek and stylish. I appreciate that this table is also water resistant so it shouldn’t be a potential disaster if a drink is spilled or sweats onto the finish. 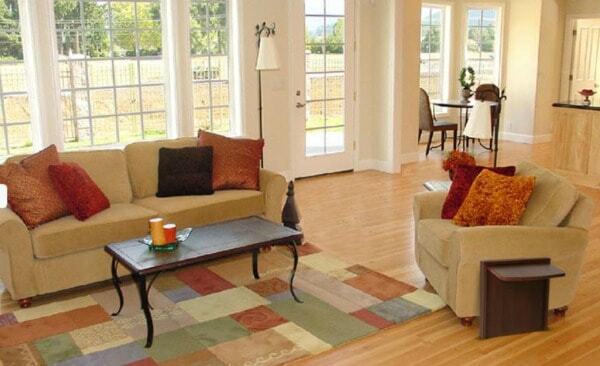 It is also scratch resistant in order which is a benefit especially in our house with three young children. 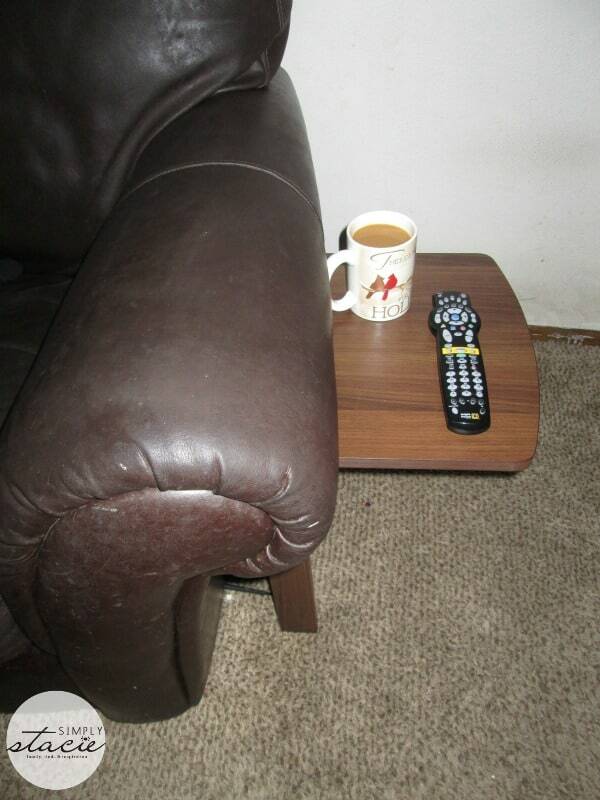 I tested it out using it as a side table in my living room by attaching it to our couch. It is so easy to set up and use and I love that it is sturdy enough to hold the remote, my book and a large mug of coffee. In fact, it can hold up to 10 pounds. There are so many ways that the Tuc-Away Table will be useful such as parties, tailgating, dorm rooms, kid’s rooms etc. I love the functionality and style of the Tuc-Away table which I find to be the ultimate space saving solution for our home. You are invited to visit the Tuc-Away Table website to learn more about this table as well as purchasing information. The small-end tables can be used for numerous purposes and it is considered as ideal furniture for resting coffee mugs, magazines, showpieces, lamps, drinks, remote controls etc. You can also unattached these tables within seconds and store them in a closet. I like how easy it is to put up and down!! I learned they are easy to assemble. I like the black best. I liked the fact that you can get the tuc away table also in black! I like the black tuc- away. i love this, we have limited space and it would be so nice to have in our living room. i am tony l smoaks on rafflecopter. I learned that Tuc-Away Table is patent protected product produced and sold by Mullner LLC. I like the little room it takes up; all the while providing enough space for what I intend to use it for on a daily basis! I like the Black Tuc-Away Table. I learned that it comfortably holds 10 lbs. I leaned that the table is designed to attach and detach to all types of furniture, such as couch, chair, bed, armoire, recliner, etc. I learned that the furniture that you would like to attach the Tuc-Away Table to, must measure at least 1.5 inch and at most 10 inch from the floor to the base. I like that it can support the weight of my kitty, who would eventually venture on to it. I love that it comes in black! 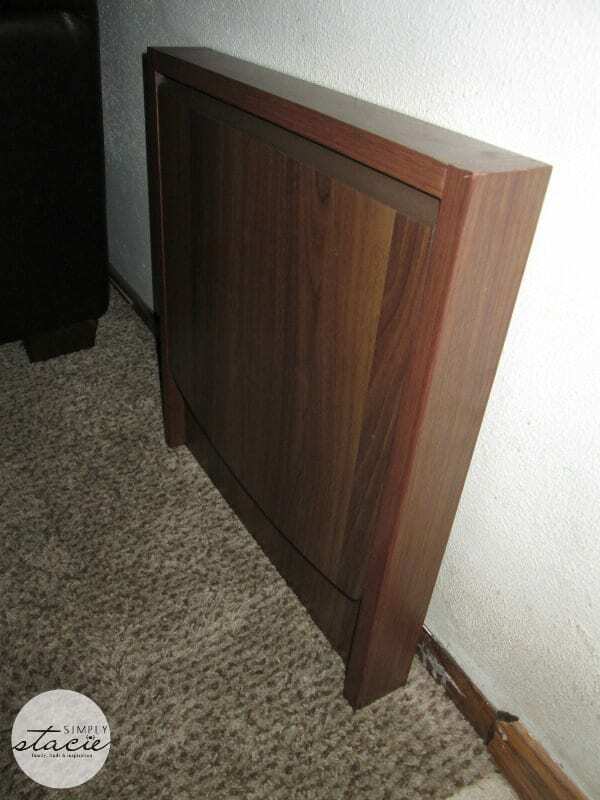 I learned about a finish called “melamine finish–” which I had never heard of before. It’s also nice to know that it is both scratch proof and water-resistant. I like that it has a water-resistant finish, great for putting my drink on. I learned that they have a funny puppet video praising their table!